Anastasia: It should be mentioned that the building of Saint Sophia’s Cathedral in Kiev experienced numerous partial destructions by time and people. Furthermore, in the 17-18th centuries, as a result of the Cathedral reconstruction, its external appearance was significantly changed. Rigden: This is truly so. But interestingly, despite all these vicissitudes of almost a thousand years, up to this day in the arch of the main altar the same Old Russian Orthodox pearl is shining in a special niche – a six-metre mosaic of the Mother of God, the so-called Oranta (Virgin Orans). In Christianity, it is considered to be one of the iconographic types of the Mother of God, portrayed full-height with Her arms bent in elbows and raised to the level of Her face. 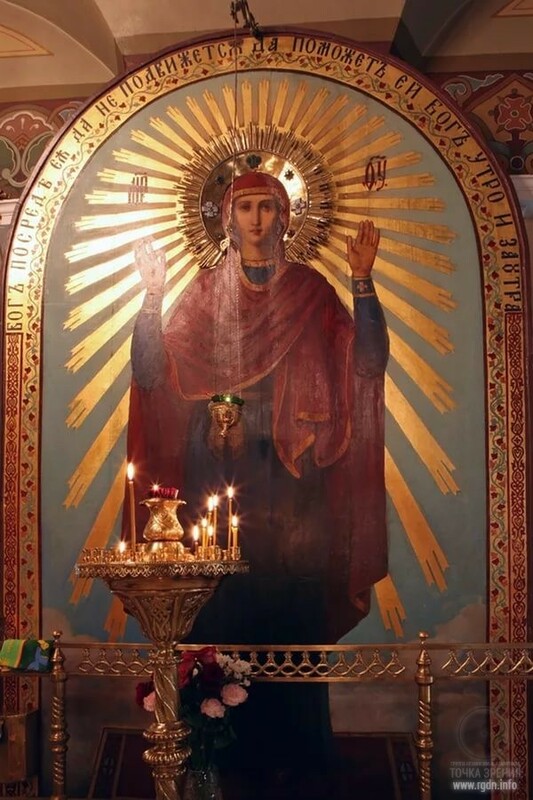 Anastasia: So, the arms of the Mother of God are depicted in the form of a symbolic Allat sign – the same ancient symbol of spiritual fusion of the Personality with the Soul, enlightenment and cognition of the Truth, and attainment of spiritual liberation. This symbol was known to the ancient peoples in different times in the form of the aforesaid symbol that resembles a bug, and also of the images of ancient goddesses with raised hands. It’s the same ancient symbol as was recorded by “prehistoric” people as a petroglyph indicating that a human being can reach such a state of spiritual liberation only with involvement of the generative powers of Allat. In the context of the story about Kievan Rus, I would like to draw your attention to another equally important page in history. Initially in Kievan Rus Archangel Gabriel and Virgin Mary were revered together, as it should be in fact. Only much later, in the 15th century, people singled out the worship of Archangel Gabriel from the cult of Annunciation of the Most Holy Mother of God, although this is incorrect. Where the Virgin creates in a holy way, there is always the Holy Spirit with Her. I familiarized myself with the elder’s life story composed by Archimandrite Simeon (Kholmogorov). I didn’t find any description of the vision there; perhaps it’s in other sources. Some sources indicate it was a dream, although let me note the life story contains numerous interesting occurrences associated with the Mother of God. Let’s consider I have failed to find the primary source where this dream is described, though in my opinion the dream is very interesting. Who is the giant that throws a net on travellers? To me, it’s obviously the animal mind system. At that, what is the role of the Mother of God here? She rises as a wall and prevents the giant from catching a traveller with the net. Pure and simple, the Mother of God protects people who follow the spiritual path from bad thoughts regularly inspired by the system. The system as if throws a net, trying to catch a traveller, but a sincere appeal to Our Lady, a prayer for Her support on the spiritual path, acts as a wall protecting the traveller from the giant and his net. This is how I understand the above vision or dream. Therefore, in my opinion, it is very important for a person who follows the spiritual path to address Mary for support, for such appeals never remain unheard and every appealer will get support as a “wall” protecting against bad thoughts and intentions. The Song of Mercury of Smolensk as a work of literature was created not earlier than in the second half of the 15th – beginning of the 16th century, but it is based on a local Smolensk legend that emerged in the times of the Mongol invasion and rule in Rus. Thus, let’s date The Song of Mercury of Smolensk to the 13th century. There are two versions of the song, which have no direct relation to one another, yet originate from the same legend of Smolensk deliverance from Batu Khan’s army. … Local dwellers fell into great sorrow and stayed put in the Cathedral of the Most Holy Mother of God, weeping and humbly appealing to the all-mighty God, His Blessed Mother and all saints for protecting the city against all and any evil. And God’s sign emerged for the dwellers: outside the city, in Pechersk Monastery near the Dnieper river, the Blessed Virgin appeared to a sexton of that church and said: “Oh, God’s man! Hurry to the cross by which my saint Mercury is praying and tell him: “God’s Mother is calling you!” The sexton found the saint near the cross and called him by his name: “Mercury!” The saint asked: “What do you want, my lord?” The sexton responded: “Hurry, brother, God’s Mother is calling you to the Pechersk church.” Having come to the church, the saint saw the Blessed Virgin sitting on a golden throne, holding little Christ near Her chest, and surrounded by angel forces. He fell to his knees and bowed with great awe, staggered. Our Lady got him up and said: “Child Mercury, my chosen one! I send you: go fast and ensure vengeance for the Christian blood; go and overcome the evil king Batu and his entire army! Then a handsome man will approach you – hand over all your weapons to him. He will cut your head, and you take it and go to your city to accept death there, and your body will be placed in my church.” He started grieving, cried and said: “Oh, Blessed Virgin, the Mother of Christ our Lord, how can I, your unworthy slave, be capable of fulfilling such a great deed? Don’t you, our Mistress, have the heavenly forces to overcome the evil king?” Having taken Her blessings and got prepared, he stepped back, bowed to the earth and left the church. He found a bold horse nearby, saddled it and left the city. 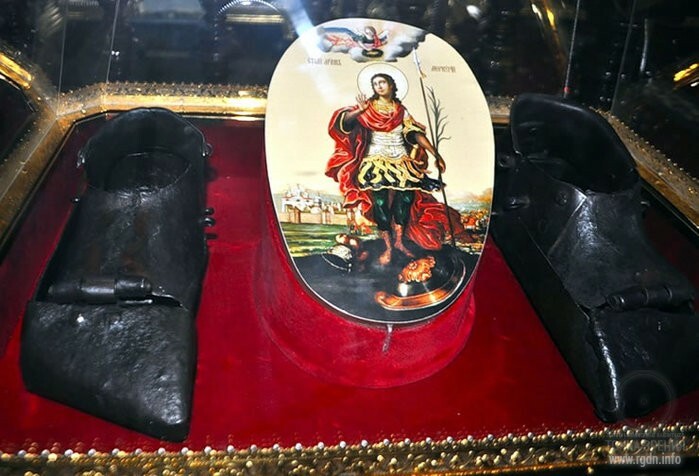 In Smolensk Assumption Cathedral, sandals of the warrior Mercury, the patron of Smolensk, are kept as a cherished relic. Legend says he was exactly the one who stopped the Tatar invasion of Smolensk in the 13th century. Near Dolgomostye Village 12 kilometres away from Smolensk he conquered the main Tatar warrior, and the whole enemy army returned back and left the city. 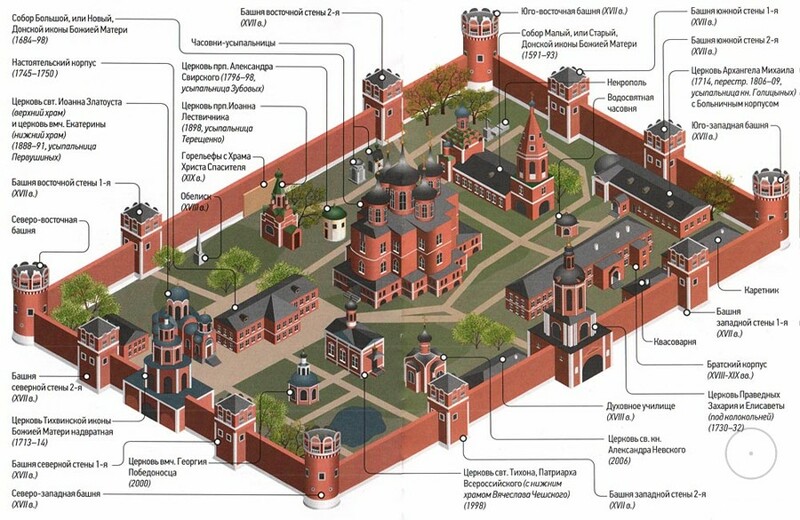 Hence, Smolensk avoided destruction unlike many other cities of ancient Rus. It is believed that Our Lady Herself sent Mercury to perform this feat of arms, and so his extant sandals as a part of his vestment are regarded as sacred. … When the revered icon taken from the city of Vladimir was approaching Moscow on the fifteenth day of the month of August – on the feast of the Assumption of Virgin Mary, the metropolitan bishop along with other clergy and plenty of people came out to meet it. Seeing the sacred icon, everyone fell to the ground and kneeled before it as before the Blessed Virgin herself who would have come to them, and they accepted the icon with great joy. Looking at the icon, everybody cried with a deep feeling, prayed to the Theotokos, and asked Her to save them from the Turkic invasion. Everyone’s diligent prayer was not vain: on the same day when the revered icon of the Theotokos was brought to Moscow, the evil Turkic king Timur Lang was frightened by a terrible vision he saw in his sleep and ran back together with his army, though no one was pursuing him. His vision was as follows: he saw a high mountain in front of him, from the top of which prelates descended, carrying golden crosiers in their hands and threatening him. Above the prelates Timur Lang saw an extraordinary light in the air and some Queen who was among the prelates in unspeakable glory, dressed in a purple robe that shined with lightning-like rays brighter than the sun. Numerous armed warriors were around the Queen, served Her, and as if prepared for the war. The Queen’s arms were stretched towards the heaven – She was as if praying. It seemed to Timur Lang that the Queen threatened him and ordered to leave the borders of the Russian land, and She as if ordered Her army to pursue him. The miserable man trembled, groaned, and was in frenzy. 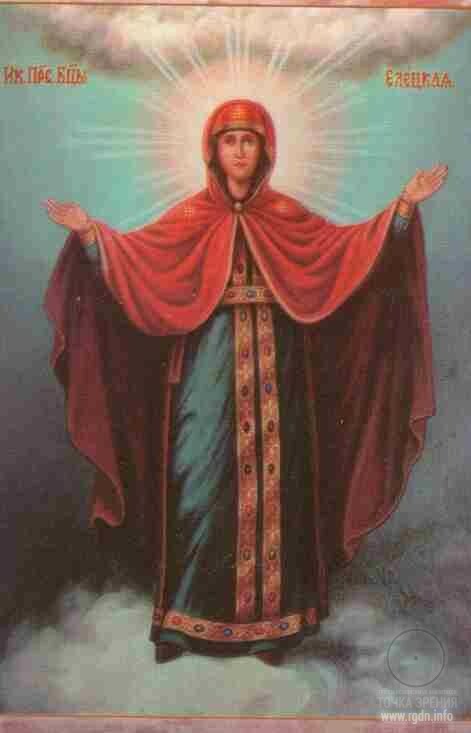 “The Queen in the vision is the Christian Mother of God, the Lord Jesus Christ. She obviously intends to protect the Christians, for She is their Patroness and Protectress. The evil king with his entire Turkic army turned back and shamefully ran away, for it seemed to them numerous regiments of Russian warriors were pursuing them. Terrified and shaking, the enemies trampled each other, abandoned their weapons, loots and captives. Thus the Orthodox Christians were granted victory over the enemies without any fight or bloodshed, owing to the prayers of the Most Holy Mother of God. The icon depicts the Heavenly Queen’s apparition to Timur Lang in 1395 in the city of Yelets. The Light-Bearing Virgin appeared on MountArgamach with a multitude of saints to frighten Timur Lang who was leading his horde to Rus. On the same day of 26 August, Moscow inhabitants met the wonder-working icon of the Theotokos of Vladimir and prayed in front of it, asking to save them from the terrible invasion. Later on, in the place where they had met the icon, the Monastery of Purification of Virgin Mary was established. 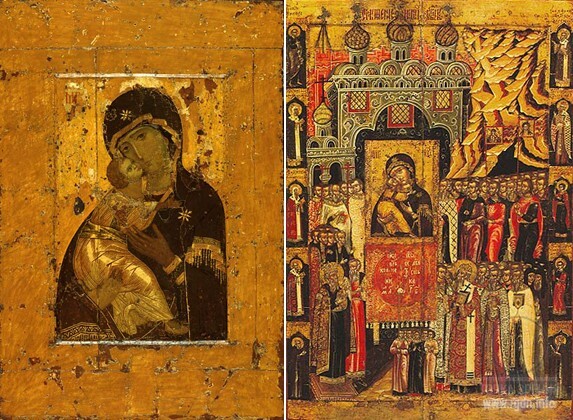 During Timur Lang’s invasion in 1395, under Vasily I, the original icon of the Theotokos of Vladimir was transferred to Moscow to protect the city against the conquerors. 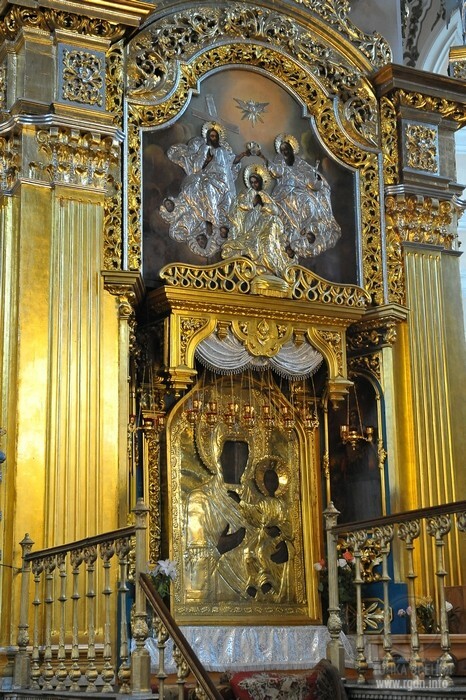 The icon was kept in the Assumption Cathedral of the Moscow Kremlin, to the left of the Tsar’s Gate of the iconostasis. In 1918 it was removed from the cathedral for restoration, whereas in 1930 it was transferred to the Tretyakov State Gallery. 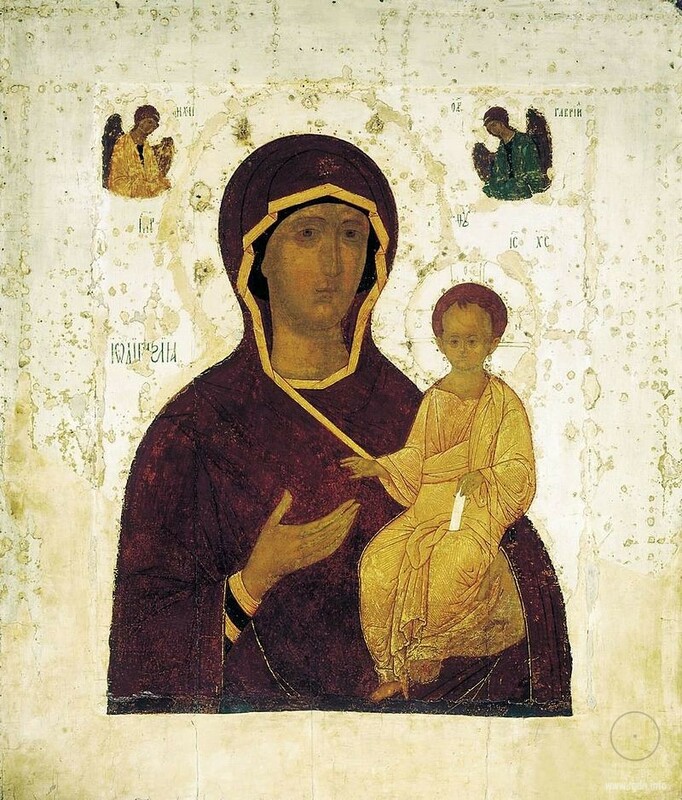 Since September 1999 the icon of Our Lady has been kept in the church museum of Saint Nicholas, which is located in Tolmachi and belongs to the Tretyakov State Gallery. In 1408 Idigu Khan suddenly approached Moscow. The prince went to Kostroma to gather the troops. 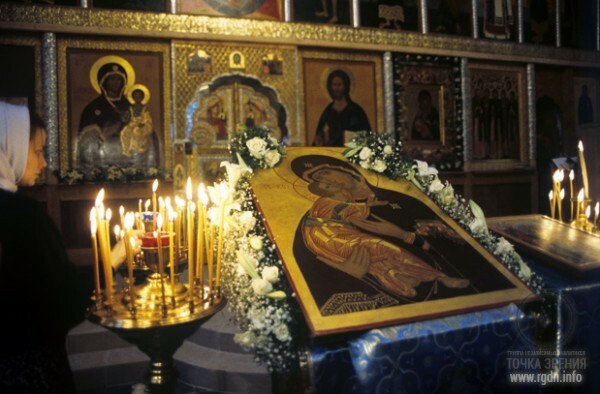 Not expecting any help from people, Moscow inhabitants zealously prayed before the icon of the Theotokos of Vladimir: “Merciful Mistress, our relentless Protectress! Don’t give us into hands of our enemies, but save us, those who set hopes on you.” Eventually Idigu Khan, having received a news about a rebellion in the horde and not even started the siege of Moscow, hastily moved away from Moscow for a tribute. In 1451 the Tatar prince Mazovsha came up to Moscow with the troops of his father Sedi Akhmet. The Great Prince left the capital and went to gather the force. The Tatars set their flares on fire and started attacking. It was a dry and hot season, and the wind was carrying dense clouds of smoke and ashes straight on the Kremlin. Russian warriors who were standing on the Kremlin walls started suffocating. In the sultriness of the terrible fire, in the clouds of smoke, the prelate Jonah conducted religious processions along the city walls. 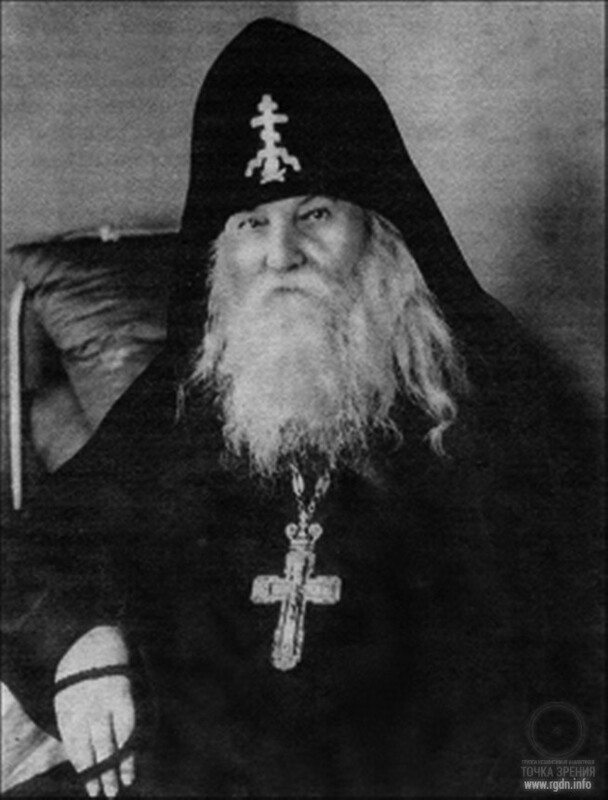 Seeing Antony, the monk of the Chudov monastery, famous for his pious life, the prelate said to him: “Antony! Pray to God as diligently as you can, so that our city would be saved.” Antony responded: “You are God’s great bishop, and the Mother of God, our quick Helper, will not distain your prayer. 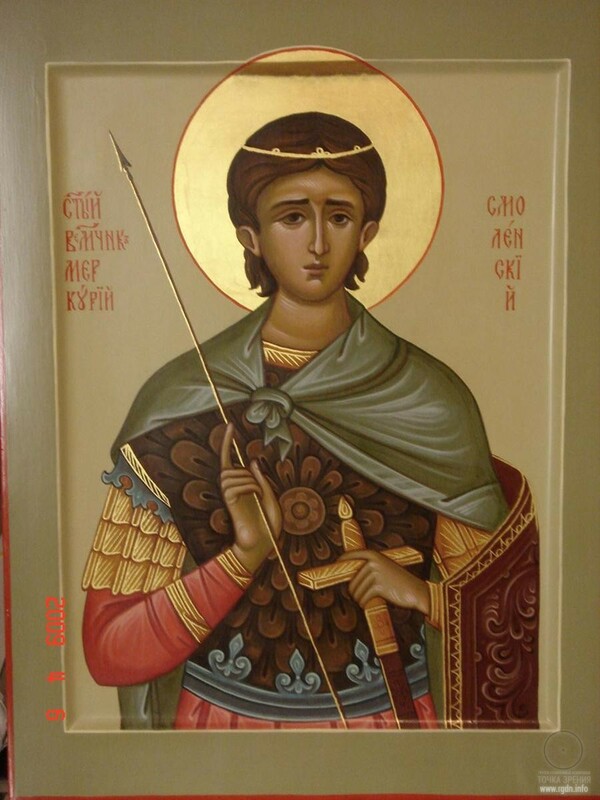 She has already prayed to Her Son, and He will save the city.” As soon as Antony said so, he fell dead to the prelate’s feet, pierced with a Tatar arrow. A sortie was made, and the Russian troops fought with the Tatars until late at night. A new night attack was also expected, so they prepared cannons, crossbows and harquebuses on the city walls. However, the sun rose, and Muscovites saw the enemies had retreated from Moscow. The besiegers’ camp was empty. Mazovsha left that night, having taken only light carriages, while all heavy items were left as a trophy for the beleaguered. According to the chronicler, the Tatars heard an unusual noise at a distance, thought it was the Great Prince coming with a large army, and escaped in disarray. Having found out the city had been miraculously saved, the Great Prince told everyone that the Heavenly Queen Herself had put the enemies to flight. He returned to the capital, hurried to the glorious icon of the Theotokos of Vladimir, and sang his praises to the Protectress of Moscow. Eight years after Mazovsha’s invasion his father Sedi Akhmet took up arms against Moscow himself. He boasted that he would conquer entire Rus. However, the Great Prince’s son John drove his army away from the Russian land, and the victory was gained thanks to Our Lady’s miraculous protection. When the prelate Jonah learned the Tatars had been ousted, he ordered to arrange a side chapel of praises for the Most Holy Mother of God in the Assumption Cathedral. 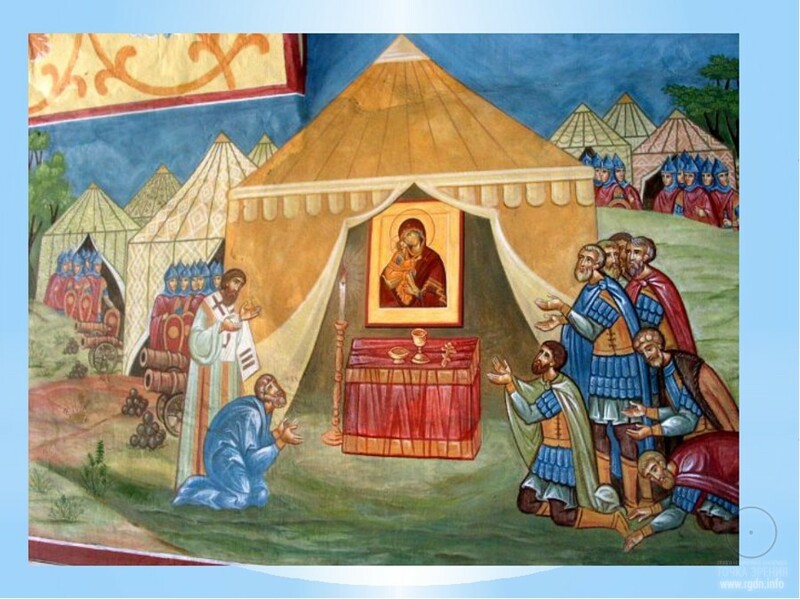 The prelate relied so much on Our Lady as to protection of Rus that he foretold the forthcoming triumph over the Horde, and together with the archbishop of Novgorod prayed for the final deliverance of Rus from the Tatar yoke. The great prelate’s prayers were soon implemented. In 1480 Akhmat Khan came to Rus, threatening to ravage it. Since 1478 the Russian state paid no tributes, though it was the Horde’s debtor. United under the Golden Horde, the troops of Kazan, Crimea and Astrakhan khanates came for the outstanding tribute. Having placed his forces in Kolomna, Serpukhov, Tarus and other towns along the Oka River, the Great Prince John III went to Moscow “to ask Our Lady the All-Merciful Saviour and the saint wonder-workers for support and protection of the Orthodox warriors”, as Voskresenskaya Chronicle says. The Great Prince John decided to repulse in an open battle. Russian forces stood against the Tatar troops, and only the UgraRiver separated them. The Russians called the UgraRiver “Our Lady’s Belt protecting the Moscow land”. This time the Belt indeed protected the Moscow land from Akhmat’s invasion. For two weeks the Tatars could not cross Ugra, threatening they would wait for the winter and cross the river over-ice. Frosts set in, Ugra started getting covered with ice, and John ordered his troops to retreat. The warriors thought John was afraid and avoided the battle, so the Russian regiments were not retreating, but rather ran from the enemies. The Tatars only needed to hit the Russian rear. However, as chroniclers indicate, a miracle happened: looking at the opposite Ugra bank left by the Russians, the Tatars thought the Russians had prepared ambushes for them. Seized with terror, the khan hastily moved away. It was a truly amazing spectacle: the two armies ran from each other, not being chased by anyone. Finally the Russian troops stopped, but Akhmat already left for his land, having done no harm to Rus. Chroniclers believe only God’s help was the reason of Akhmat’s escape: “May light-headed not boast about the terror of their weapons! Neither weapons nor human wisdom saved Rus this time, but the Lord Himself.” The Great Prince and the entire people piously ascribed the fear that had put the enemies to flight to the invisible support of the Mother of God. In memory of Moscow deliverance, the feast of the icon of the Theotokos of Vladimir was established on 23 June (6 July). 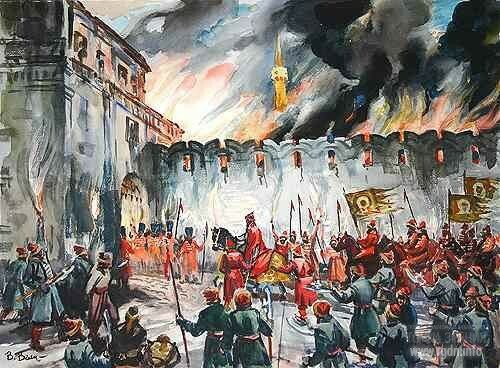 As for the feast on 3 June, it was introduced in memory of Moscow rescue in 1521 from the invasion of Tatars led by Mahmet Girei Khan. Tatar forces were approaching Moscow, committing Russian cities and settlements to flames and destruction, exterminating local dwellers. The Great Prince Vasily gathered a force against the Tatars, while the Moscow metropolitan bishop together with Moscow inhabitants were diligently praying for deliverance from ruin. At that terrible time a pious blind nun got a vision: prelates were leaving the city via the Saviour Tower of the Moscow Kremlin, taking away the icon of the Theotokos of Vladimir – the main sacred item of Moscow – as God’s punishment for sins of local inhabitants. Near the SaviourTower, Sergey of Radonezh and Barlaam of Khutyn met the prelates and tearfully asked them not to abandon Moscow. All of them offered an ardent prayer to the Lord for forgiveness of all sinners and deliverance of Moscow from the enemies. 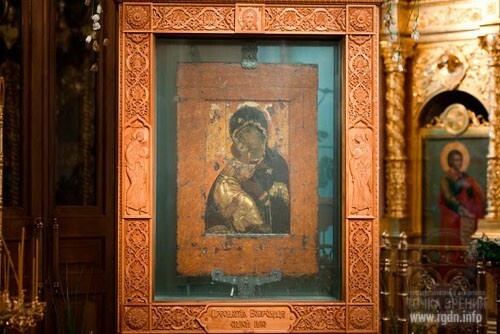 After the prayer the prelates returned to the Kremlin and brought the holy icon of Theotokos back. A Moscow saint Vasily had a similar vision: he got a message that Moscow would be saved through Our Lady's protection and prayers of saints. At that, the Tatar khan had a vision of Our Lady surrounded by a formidable army that rushed on Tatar regiments. The Tatars took to flight in fear, and the Russian capital was saved. 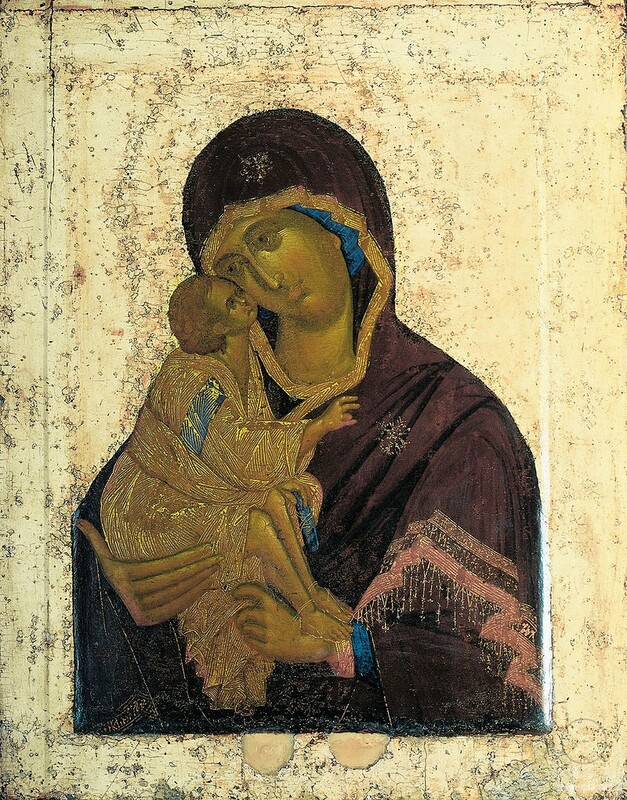 There is scant information available on the creation of this famous icon, so art historians have diverse views as to the year and place of the icon painting. There are even sceptics who endeavour to dispute the authorship of Theophanes the Greek (in their opinion, the holy image was drawn by one of his pupils). However, over a long time a tradition formed based on historical materials and verbal legends, by which Theophanes the Greek created this masterpiece before 1380. Why so? The answer may be found in Historical Description of Donskoy Monastery in Moscow, composed in 1865 by the well-known historianI.E. Zabelin. 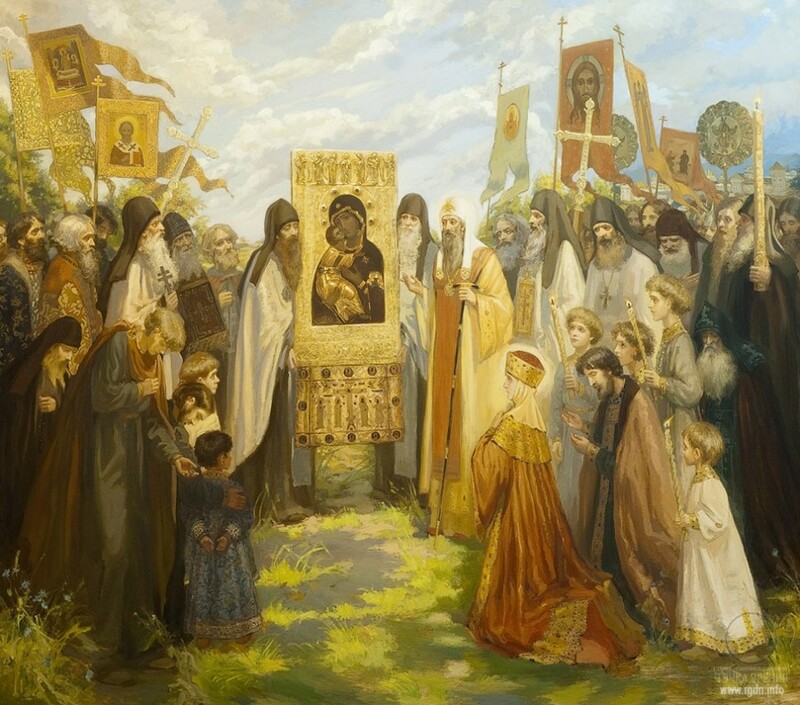 In the said work the author refers to an ancient manuscript saying that before the Battle of Kulikovo Cossacks presented the icon of Our Lady to the Great Prince Dmitry Donskoy, and via this icon the Heavenly Queen Herself endowed the Orthodox warriors with force and courage to overcome the foes. During the reign of Fyodor (Theodore) I Ivanovich in 1591, the Swedes invaded Novgorod region, while Crimean Tatars headed by Kazy Girei came and threatened Moscow. 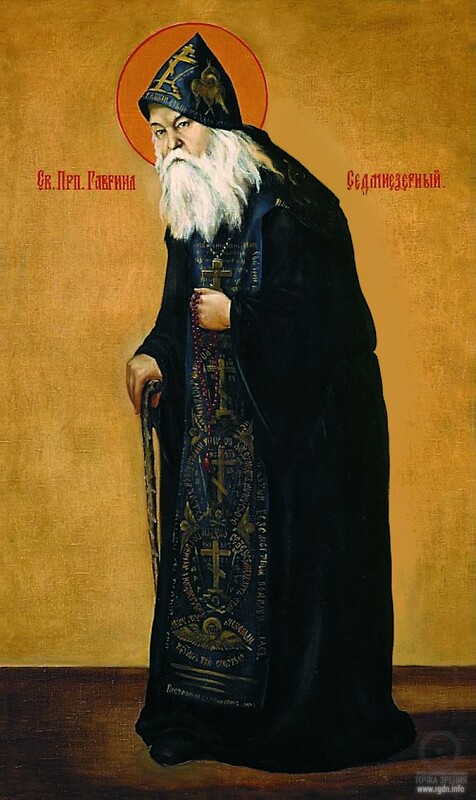 Tsar Fyodor, frightened by the sudden invasion and not hoping to triumph over the numerous Crimeans due to division of his troops, resorted to diligent prayer addressed to Our Lady of the Don, performed a religious procession around the city, and ordered to place the icon of Our Lady amongst the army files. While praying at night, the devout tsar got a message from the Helper of Christians that by Her intercession and the power of Christ the Saviour he was to overcome the foes. As a matter of fact, the battle was already taking place for 24 hours, and the foes were fighting with frantic zeal. But suddenly the enemies started running away, frightened by an invisible force. Orthodox warriors started chasing them, killed many of them, took others prisoners, and captured their entire camp. To express gratitude to the Protectress of the faithful, that same year the tsar established Donskoy Monastery in the place where the wonder-working icon had been kept amongst the Orthodox army files. 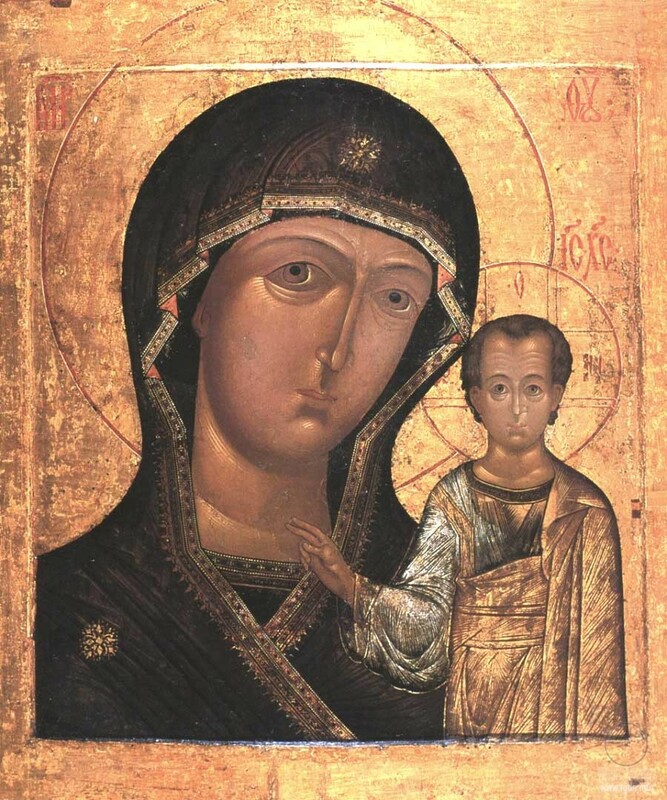 The holy icon was placed in the monastery, and an annual feast in honour of Our Lady was introduced to revere the icon of Our Lady of the Don on 19 August. Religious processions to the monastery also began since that time. In 1612, when the city of Kursk was besieged by the Poles, captives told they had seen a Lady on the city walls, accompanied by luminous men. 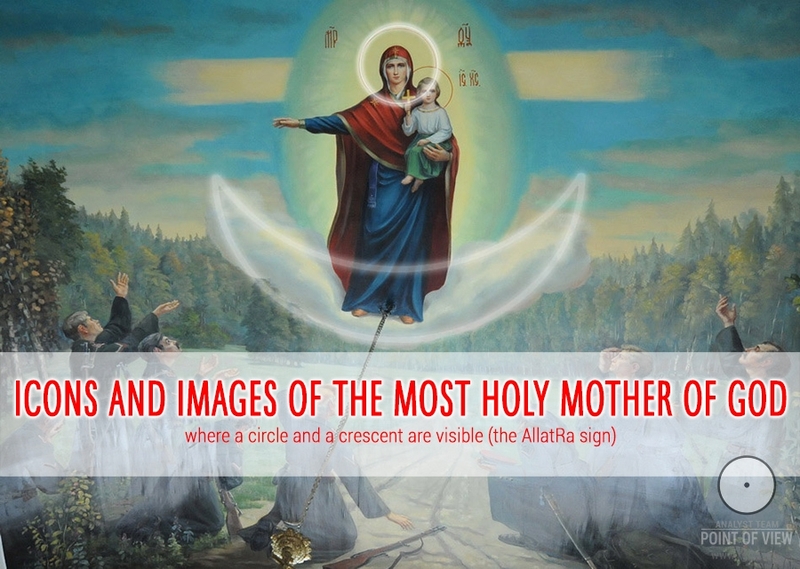 During the siege some city dwellers also saw the Mother of God in the clouds along with two light monks – She was crossing the city from the sky. Soon the Poles were driven away from Kursk. 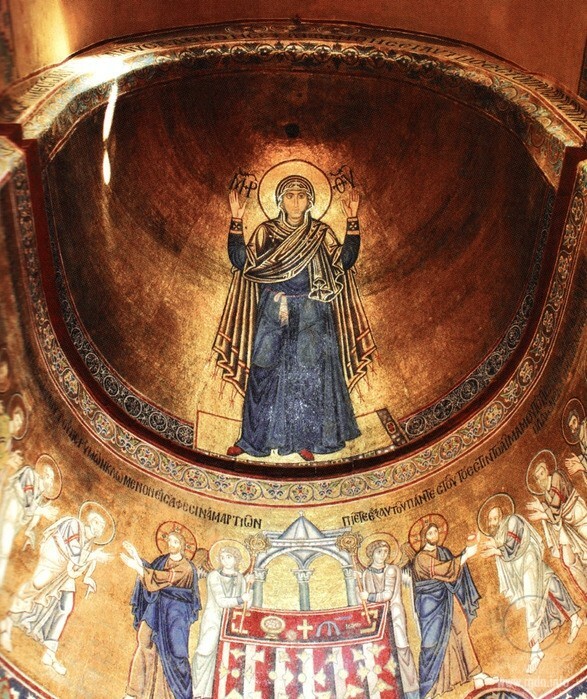 According to legend, Hodegetria was drawn by the evangelist and artist Luke. From Jerusalem the icon was brought to Constantinople and became the main sacred object of the Byzantine Empire. In the 11th century the icon arrived to the Russian land. In 1101 Grand Prince Vladimir Monomakh placed the holy image in the new Cathedral of the Assumption of Virgin Mary in Smolensk. 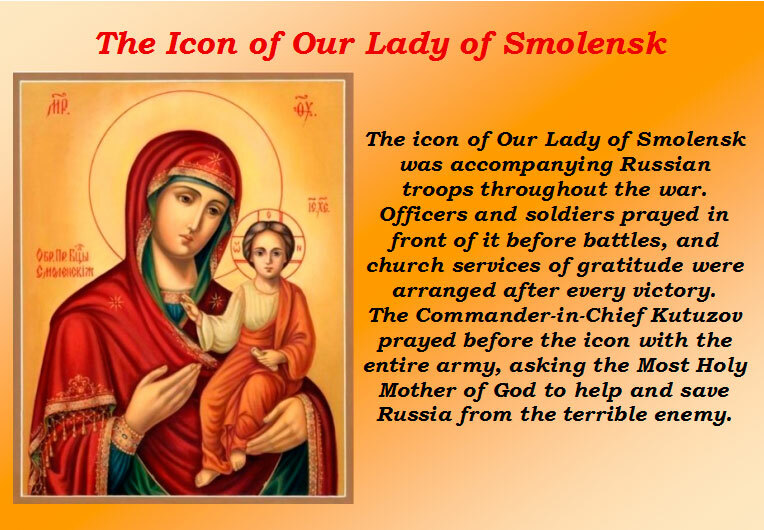 Since then the image has been called Our Lady of Smolensk. Numerous copies of the icon have been made. Experts say the icon exhibited in Smolensk is not the original wonder-working icon, but another wonder-working Hodegetria of the late 16th or early 17th century. It is unknown where the original icon is, and whether it still exists at all. The icon was found in Kazan in 1579 after the fire that had ruined a half of the city. 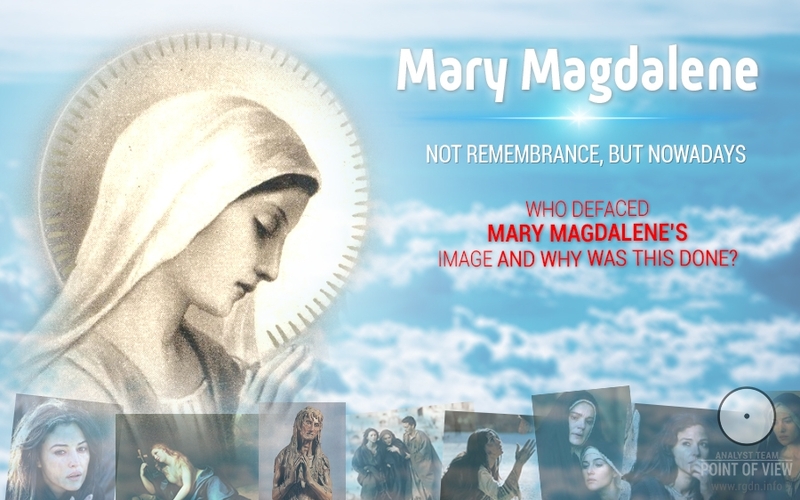 Legend says the Holy Mother of God appeared to nine-year-old Matrona and indicated a place where the icon was hidden. The icon wrapped up in a man’s shirt sleeve was discovered one metre below the ground. Eyewitnesses said “the icon was shining as if just been painted”. In 1709 Peter I with his army prayed before the icon of Our Lady of Kazan near KaplunovkaVillage. Many contemporaries believed the victory in the Battle of Poltava was exactly due to the protection rendered by the icon of Our Lady of Kazan. In 1812 Kutuzov prayed before the icon of Our Lady of Kazan right after he had been appointed the Commander-in-Chief, and on 22 October – on the feast of the Kazan icon – Russian troops gained their first victory over the French. 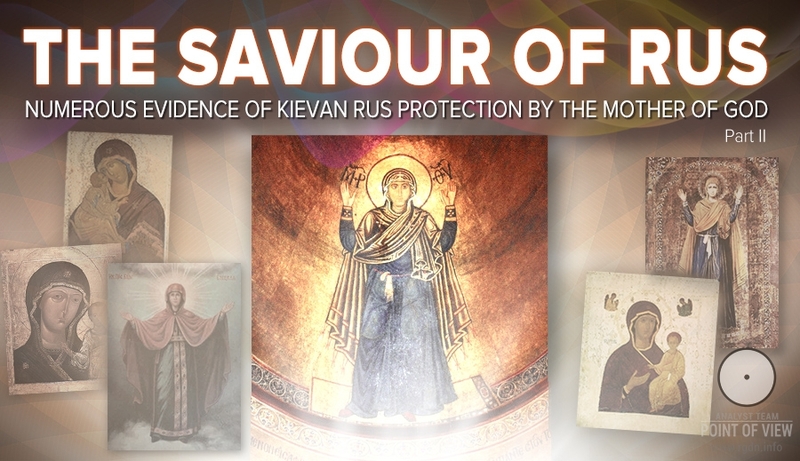 The icon of Our Lady of Kazan is believed to have helped the USSR to win the 2nd World War. Legend says Marshal Zhukov carried the icon among the battlefronts. This fact was confirmed by his daughter M. Zhukova in her book Marshal Zhukov: The Concealed Life of the Soul. In April 1945 Virgin Mary appeared in the sky in order to stop bloodshed when Russian troops were conquering the city-fortress of Königsberg. … In April 1945 Virgin Mary appeared in the sky in order to stop bloodshed when Russian troops were conquering the city-fortress of Königsberg. As of 9 April the Germans kept only the city centre in their hands, and their hope for Hitler’s miraculous weapon was fading with every passing hour. In basements and bomb shelters thousands of wounded people, women and children gathered. Against the sky background a tremendous ghostly female figure in dark garments emerged. Her face of heavenly beauty was full of sorrow. Her arms were stretched forward in an all-forgiving or stopping gesture. Thousands of German soldiers noticed the tremendous figure in the sky. They perceived the apparition as a call to stop resisting and surrender. Interestingly enough, the apparition was not seen by Russian officers and soldiers. Süddeutsche Zeitung published memoirs of the German lieutenant Hans Brinkman of Königsberg battalion, where he described the tragic events of the Königsberg storm: “The vision of Madonna’s giant figure appeared in the sky all of a sudden. She rose from somewhere behind the Russians. Explosions showed through the transparent haze of the image. Now and then puffs of smoke floated by. Many soldiers kneeled and prayed, not paying any attention to nearby explosions or whizzing bullets. Should we refer to historical events, there is a fact that speaks for itself: in the last two hundred years, the two global-level tyrants – Napoleon and Hitler – in their attempts to subdue the whole world stumbled over one and the same place. Napoleon occupied entire Europe and reached Moscow, but then a dismal end was in store for him. Almost the same applies to Hitler as well. In this article I have omitted the Battle of Stalingrad, which is considered to be one of the turning points in the 2nd World War. The Germans failed to occupy just a tiny piece of land of some couple hundreds of metres, so that they could have reported to Hitler Stalingrad had fallen. How was this possible? Many ascribe it to the heroism of the Soviet people and the defenders of Stalingrad, and we surely cannot deny that. However, in my opinion the decisive role was played by Our Lady’s protection, just like many times before. 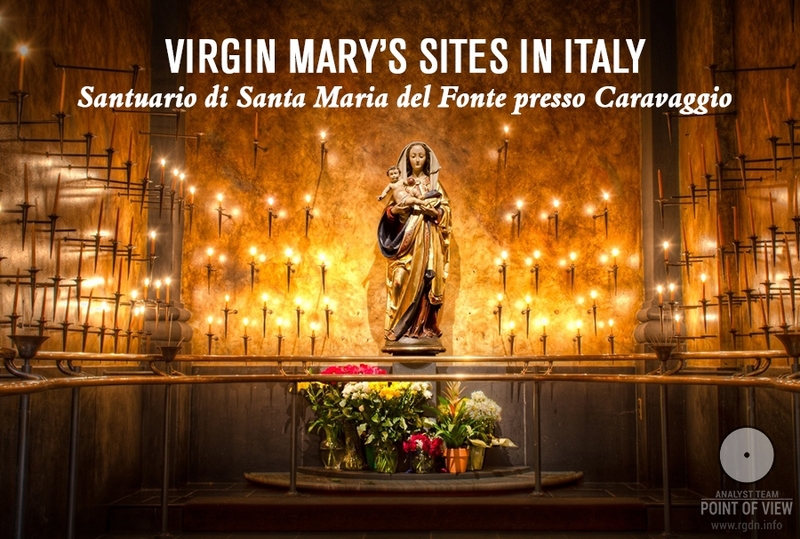 Mary’s care for Her “Home” and those who live there is truly great. Hence, not without reason She is called the Saviour of Rus! Peace Be upon You, Good People!